Forfar Removals always aim to provide the best possible personal service to all of our customers. We understand that everybody has different needs and wishes and that moving your precious possessions, safely and securely offers you the peace of mind you are looking for in your removal company. With no job either too small or too large, here at Forfar Removals we pride ourselves on being a flexible and friendly company. So whether you are moving your home or your business, need storage or help with packing, or want your precious antiques delivered nationwide, Forfar Removals are always at your service. It is with great pride that we can report that 87% of our revenue is generated either by repeat business or by personal recommendation. Please take your time to look around our website, we are happy to hear from you should you have any questions or would like any advice regarding your removal, relocation, delivery, storage or any other services that we offer. We are delighted to have received the latest of our Awards from the National Guild of Removers and Storers (NGRS). 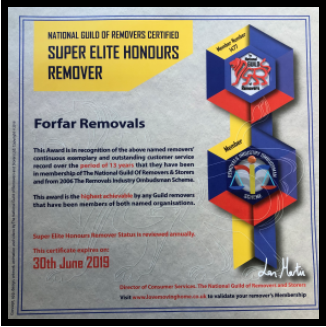 We have been awarded Super Elite Honours Remover status. This award is given in relation to the consistently high level quality ratings by customers on our quality questionnaires and an exemplary complaints record throughout our 13 years as members of the National Guild of Removers and Storers. We are proud to support such excellent charities at this time of year. As we come to the end of another busy year, we would like to thank all who supported us throughout the last 12 months. Renewal of our ISO accreditations. Award of our Super Elite Honours Remover Status. Major relocation work for Thornton's Solicitors throughout Scotland. Various contracts carried out in relation to the V & A Dundee. Movement of specialist scientific equipment for Eurofins. Privileged to carry out various work for D C Thomson. National Health and Local Authority work. And the many other commercial moves carried out throughout the year. Not forgetting the hundreds of private removal customers who chose Forfar Removals to move home. As a company we believe in giving back to the community. Relocation of Oor Lillies and Strawberry Thief throughout Tayside and Fife. Design competition for Forfar Academy Pupils to design a New Home card. Support of local boy's club football team and other local football clubs. Various sponsorships and donations to support local fundraising efforts. Supporting Maggie's Penguin Parade on Auction Night. Offering our time, talents and donations to various groups.